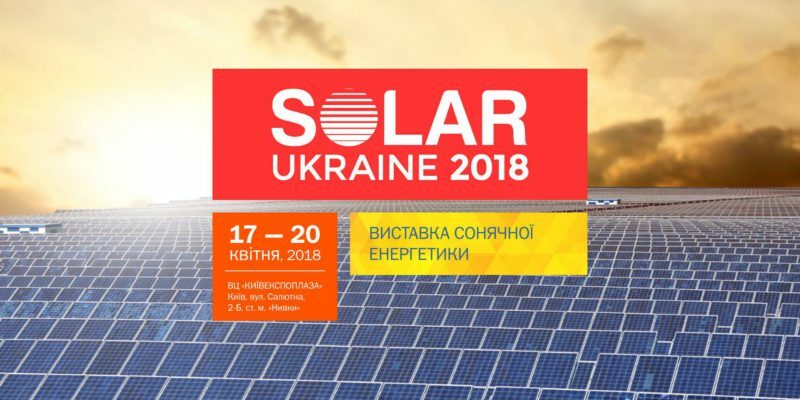 Solar Ukraine 2018 – international Exhibition of Solar Energy. Solar Ukraine 2018 is the first international exhibition dedicated to the generation and utilisation of solar energy in Ukraine. It will take place on the grounds of KyivExpoPlaza Exhibition Centre (address: 2-B Salyutna str., Kyiv). Solar Ukraine 2018 will be held on April 17-20 along with Elcom Ukraine 2018, the largest exhibition of the Ukrainian energy market. In recent years, solar energy has become an intensively developing area of renewable energy of Ukraine. The process takes its beginning in 2009 after the state adoption of a package of legislative acts providing guarantees, conditions and preferences to manufacturers of equipment and technologies, installers, individuals and legal entities of all forms of ownership that use solar energy for their own needs as well as for business. The current state program “Green Tariff” in Ukraine aims to stimulate economic entities of all forms of ownership to use renewable energy sources. The rate of the Ukrainian “green tariff" is one of the highest in the world and payments are connected to the euro rate. The system of mutual relations between the state and electric energy generators of all forms of ownership regarding selling, accounting and utilisation of electricity received from solar energy is fully formed and operates well. Solar Ukraine 2018 will provide an opportunity to make yourself acquainted with the following: solar panels and their components, invertors, solar energy storage systems, systems for monitoring, measuring and managing, solar devices, PV-components, mounting systems, mounting tools, materials and components for the production of solar photovoltaics, operation and maintenance of a solar power station, design and development of a solar power station, etc. Target audience of the exhibition: manufacturers of equipment for solar generation; companies installing solar stations; developers of solar technologies; representatives of insurance and banking institutions; organizations that implement integrated solutions of the solar power generation; companies developing the technology of solar panels installation; economic entities of all forms of ownership that use solar power for their own needs; financial companies and funds with investments in solar power generation. For more information about the terms of participation in SOLAR Ukraine 2018, please visit http://solarukraine.com.ua. Сонячна Україна 2018 – міжнародна виставка сонячної енергетики.